Reinis disliked his fat frame and sought change via the weight room. See how he shed his old-fashioned body and entered a new age of bodybuilding. He lost 60 pounds! I have always been the chubby type weighing in at an even 227 pounds at my heaviest. During primary school, looking fat became really depressing and my self-esteem was down. 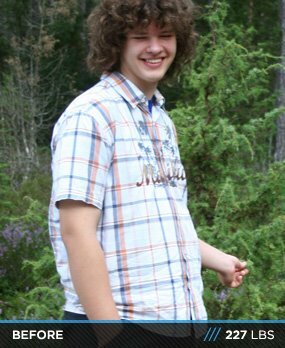 When I was 16-years old I decided to put an end to this obesity. At that time a friend of mine started lifting weights and since I didn't have any idea what to do for my weight loss, I decided to give it a try and joined him. As a beginner I didn't have a clue about proper training and diet so I pretty much did everything, including lots of cardio. It worked pretty well for me considering that my diet plan still consisted of junk foods. But only recently I found that extra motivation and willpower to change my diet plan and achieve amazing results. Reinis unleashed his body's potential, but he still has more! 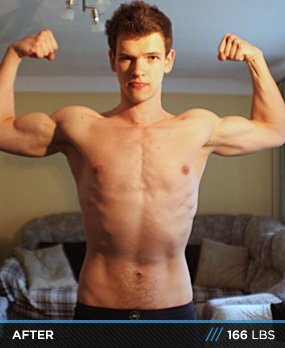 First off I didn't have any knowledge about a proper diet so I started reading the articles at Bodybuilding.com and found the Find A Plan for Male Teen Fat Loss and it really helped. I watched the videos, followed the instructions, improved my diet and even started counting my calorie intake. The results in the first 6 weeks were really impressive - I lost 11 pounds. After these 6 weeks, my body adapted to the meal plan so I had to adjust my carb intake and follow eating rules more strictly. From personal experience I can say that the hardest battle was in the kitchen, planning and preparing food for the next day. Also, I had to make lots of sacrifices (parties, etc.) for my diet to work and get results. Right now I am satisfied with the results and finishing secondary school is my top priority. Be prepared to make same sacrifices. Your body is a temple; make sure you worship it properly. Mistakes are made to learn from them.